The BBC News website has always had a dirty little secret. A secret which, if you thought things through, was obvious. But for most, that secret has been nicely brushed aside for many years. Until now. The secret concerns the “Have Your Say” section of the website. Or to give it’s more appropriate title “Perhaps Have Your Say”. What am I talking about? Well, the fact that the part of the BBC News website dedicated to feedback and conversation never really did allow you to do just that. That’s right. Almost all of those 10,000 comments sent in each day are not even read – let alone published. But surely that’s understandable? If it took someone 30 seconds to reach each comment, it would take 83 hours a day to get through all of them – in real times that’s a team of 7 people working 12 hr shifts every day. And when there’s a hot news agenda, you can double that. 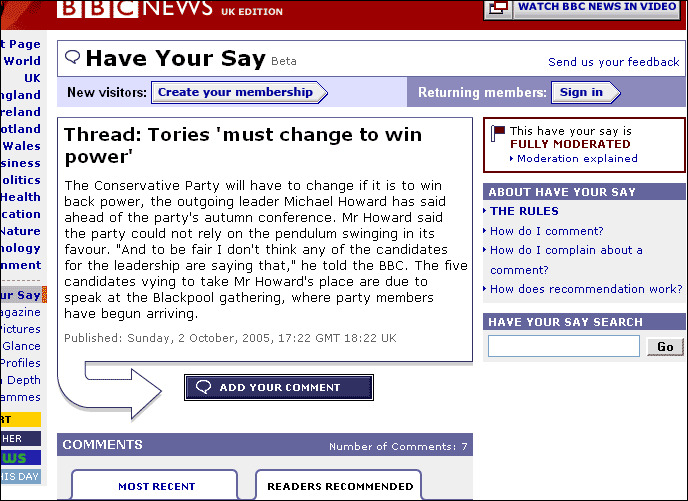 The BBC News website has always had a policy of pre-moderating comments. That means not only filtering out bad language, slander and off-topicness, but also ensuring that a fair and balanced range of comments are put up on the site that reflect the overall views received. So if it’s not read, then it’s not even considered for publication. But that’s all about to change. As editor of the site Pete Clifton announced yesterday, the BBC News website will be moving to a Slashdot/Kuro5hin style rating system. Gone is the pre-moderation and in comes a level playing field where everyone’s comment is posted (unless it is rude or slanderous). Now, it’s up the community to decide what’s hot and what’s not by using a standard rating system. Ok, this is probably nothing new or revolutionary here for you, but don’t forget this is aimed at the masses. For many users of the BBC News website, this will be the first time they have been invited to participate in a community where they rate other people’s posts to help decide the overall reflection of the debate. People will be asked to create a posting account, which opens up all sorts of opportunities for identifying well-opinionated bastions of the user-base community (and of course those who add little to add to the debate time and time again). I’m not sure whether that kind of analysis is going to initially be part of the system – but clearly there are all sorts of opportunities here for iteration two. Next Post Out Of Office: I’m off to get mental oriental!